(01.1) Anyone involved in e-Learning commissioning, Design, and related roles, together with those concerned with personal security, and privacy on-line. (02.1) The 5G (available 2019 in the UK) Network is likely to be available by 2020, and will represent a fundamental change in the way data is managed and distributed. With huge increases in speed, capacity, and reliability of connection, the opportunities presented for learning professionals will require a paradigm shift in how we think about learning, and its place in day-to-day life. (02.2) Together with incredible opportunities, 5G will force learning professionals to significantly broaden the areas for which they have concern, and consequently, how resources will be designed and deployed. (06) What is the Key Difference Between 3G-4G and 5G? (07) What will be the Consequences of Radio Spectrum Harmonisation? (08) What has this to do with Digital Learning? (10) Will there be a 6G? (05.1) The next generation of mobile connectivity will be 5G, but what does this mean for digital learning? (05.2) Although 4G is still being rolled-out in many places, and has yet to deliver its benefits, the difference between 3G and 4G cannot be equated to the difference between 4G and 5G. Those involved with the development of 5G say it will be different, very different. 06 What is the Key Difference Between 3G-4G and 5G? (06.1) A quick refresher to set the scene. 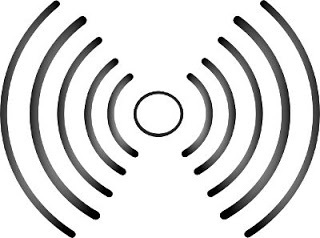 (06.2) Data is transmitted by Radio waves, which in turn are split into bands of frequencies. Each band is reserved for a specific use, such as, navigation, television, emergency broadcasts, and of course mobile data. (06.3) The distribution of Radio bands has evolved over time, in response to new technologies, and consequently is somewhat chaotic. This chaos causes problems with connection speeds and reliability, as we have all experienced. (06.4) To address this problem, and this is the key difference with 5G, there will be a dramatic overhaul and harmonisation of the radio spectrum, while allowing 3G and 4G to continue functioning. 07 What will be the Consequences of Radio Spectrum Harmonisation? (07.1.1) 5G will be faster, much faster. Developers believe data transfer rates of 800 Gbps will be possible. If you are wondering what that means in 'old money', imagine downloading 33 HD films in 1 second. (07.2.1) 5G's capacity will be vast. It is anticipated, by 2020, up to 100 billion devices will be connected to the Internet, via the 5G Network. (07.3.1) The 5G Network will be absolutely reliable. It will need to be. Devices will dynamically select one of three bandwidths (yet to be confirmed) to avoid any one bandwidth being overloaded. (07.4.1) Latency is the time difference between an action and a response. For example; the time between selecting 'Send E-mail' and seeing the message 'E-mail Sent'. 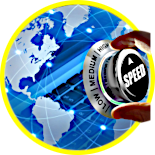 (07.4.2) It is predicted the latency of the 5G Network will be in the region of 1 millisecond. To put that into perspective, the time it takes for someone to blink their eye ranges between 100 and 400 milliseconds. (07.4.3) Low latency, for example, permits the remote control of time-sensitive and critical systems, such as robots used in operating theatres. (07.5.1) The enormous increase in the number of connected devices will result from a plethora of inanimate objects using the 5G Network. This is known as 'The Internet of Things'. (07.5.2) We have heard of remotely controlled heating systems, and the possibility of the refrigerator ordering more milk, but imagine the train telling you which seats are available, as you board, or perhaps where is the best place to stand. A light bulb could send a message, to your mobile device, informing you the bulb is about to fail. Driver-less vehicles will access the network and co-ordinate their positions on the road, with data relating to road conditions, weather, and traffic. (07.5.3) With 5G, for the first time, Connectivity will be assumed to exist, everywhere and at all times, with just about any device that uses electricity. 08 What has this to do with Digital Learning? (08.1) With the advent of 3G, and more so with 4G, so much has become possible. Resources being accessed by mobile device, Artificial Intelligence (AI), Augmented Reality (AR), Virtual Reality (VR), Learning on Demand, or Just-in-Time Learning, and of course the start of 'The Internet of Things'. 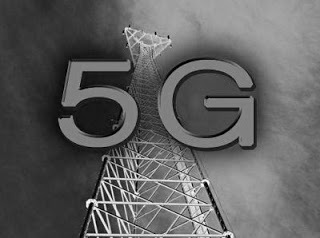 (08.2) However, 5G is a radical game-changer. 5G allows any electrical thing to communicate with any other electrical thing, at any time, very quickly, and with complete reliability of connection. As if that wasn't enough, the Internet sits bang in the middle. (08.3) 5G will do for communication and connectivity, what the wheel did for... pretty much everything else. 5G WILL BE HUGE! (08.4.1) Few in the West remember a time when people did not attend school. In fact, education for the masses has been around for less than 100 years. The modern education system is very new. This may explain why we (or perhaps I should say, governments) are still messing about with various Educational Methodologies every year or so, and let's be honest, for a significant population, compulsory education is more of a social activity than a meaningful educational experience. Of course, the same 'Methodology of the Moment' exists in the 'eLearning' industry. But that may soon change. (08.4.2) Before compulsory education existed, the masses were taught by a method best described as 'Apprenticeship'. An Apprentice hung-around a Master for several years until the Apprentice knew everything the Master could teach. The association would still continue, until the 'now qualified Apprentice' worked towards mastery, with the occasional 'slap on the head' from the Master, no doubt. This methodology has been the sole method for the masses since time began. From social skills, learning about the countryside, learning how to help Mum or Dad, in the house, or at work, to how to dress and wash oneself. Learning and simply 'going-about-one's-day' were indistinguishable. Perhaps we could name this Natural Apprenticeship. (08.4.3) I doubt we are going to demolish our teaching institutions, and return 100% to Natural Apprenticeship. However, 5G will gift Natural Apprenticeship a huge come-back. This is where digital learning makes a dramatic entrance. (08.5.1) Forget discussions about the half-life of MOOCs, or whether phones or tablets are best. We need to re-learn everything we have forgotten about Natural Apprenticeship, and then make it Tech-Savvy. (08.5.2) Yes, you can have Gaming, Gamification, AI, AR, VR, 5G will handle it (at least until we fill-it-up). The key is, we as learning professionals, imagining ourselves in the 5G enabled world, and changing our paradigm accordingly. However, we need to start planning now, 5G is not far away. (08.5.3) Let's return to our helpful light bulb. (08.5.4) Modern low energy light bulbs have 'chips' on-board. The chips are under utilised, and have spare data capacity. Remember the text message you received from the light bulb, telling you it was about to fail? The text message could include data relating to the expected life remaining in the bulb, together with technical details for the bulb, and a link to order spare light bulbs with a single tap. Additionally, the message could include links to resources regarding disposal of 'spent' light bulbs, re-cycling, and perhaps a link to a manufacturer's HOW-TO. (08.5.5) Don't think this is just logistics, or procurement, or commerce. This is learning. It is learning because the text message you received from the light bulb, taught you something you did not know before. (08.5.6) This is what I mean by a paradigm shift. Everything will be learning, in just the same way as Natural Apprenticeship, except we (digital learning professionals) will be able to make a contribution in areas, and ways not possible before. (08.5.7) With new resilient, flexible display materials, and compact high capacity batteries, it may well be the case your mobile device will fold into your pocket. If you unfold it once, it may be a smartphone, if you unfold it twice, it may be a tablet, unfold it fully, and it's a lap top computer. In short, the devices people use, will become irrelevant. (09.1) Together with the amazing opportunities 5G represents, it will also present challenges to learning professionals. As the Natural Apprenticeship model is strongly associated with learning expanding into 'going-about-one's-day', so it will expand the areas for which learning professionals will need to have regard. (09.2) As vast amounts of data are communicated about every aspect of life, so people will become more concerned with issues relating to personal privacy, freedoms, and Human Rights. In this case, especially regarding surveillance, it is likely anonymous browsing will become more widespread, possibly even the norm. This will require resources be increasingly available via https connections (secure socket layer), rather than simple http. In this event, users will connect through a series of virtual tunnels. The security arrangements of such technologies restrict the use of certain (current) supportive technologies used in learning resources. As learning professionals, we need to understand these issues, and design and distribute or resources accordingly. (09.3) It will be pointless changing just part of our paradigm, if the result is users refuse, or cannot effectively connect, to the resources we create. (09.4) This is not simply a matter for imagined future clients, or end-users. This will effect YOU and ME. 10 Will there be a 6G? (10.1) The current wisdom has it, 6G will be available around 2040. 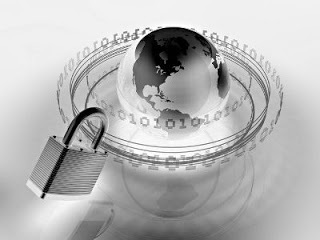 (10.2) However, with the data explosions we have seen in recent years, I would not be surprised if 6G is needed sooner. 5G, Natural Apprenticeship, and Digital Learning by Tim Cliffe © 1997-2019.